WILKES-BARRE – For the first time since 2012, the Wilkes University football team will bring back the annual Mayor’s Cup to campus following a 24-17 victory over cross-town rival King’s College Saturday afternoon at McCarthy Stadium. With the win, Wilkes closes out its season with a 2-8 overall record standing 2-7 in MAC games. King’s finishes 2015 with a 3-7 overall record, 3-6 in league contests. 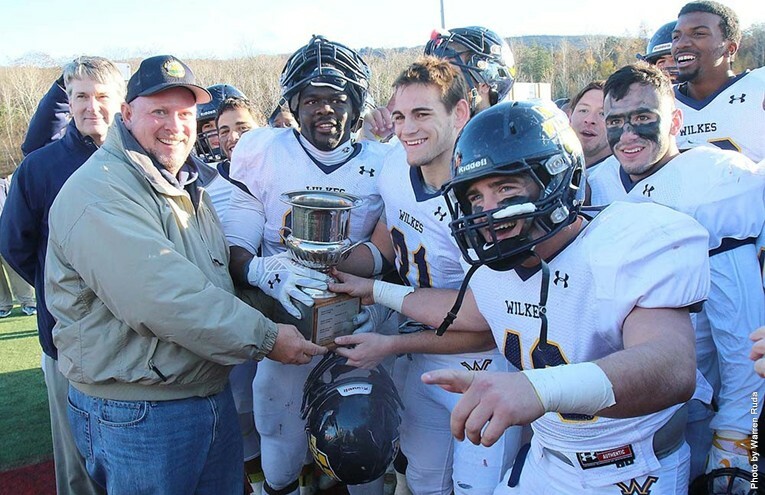 The victory brings the coveted trophy back to Wilkes where the Colonels have held a decisive advantage in the series claiming its 22nd win overall and fourteenth since playing for the Mayor’s Cup. Special teams helped put Wilkes on the board first when Isaiah Robinson blocked a King’s punt deep in Monarch territory setting up the Colonel offense inside the 15 yard line. After two rushes and an incomplete pass, Wilkes settled for a 25-yard field goal from Carl Von Glahn to go up 3-0 with 12:08 left in the first quarter. Another big play from Wilkes, this time the defense, setup the Colonels offense with great field position. Michael Paskas sacked the King’s quarterback causing a fumble which was recovered by Tanner Stengel at the King’s 44. Two plays later Brandon Latierno, starting in the place of injured starter and backup PJ Incremona and Devon Fink, took the handoff 37 yards through the middle of the line breaking free for the Colonel touchdown pushing the advantage to 10-0 with ten minutes on the clock. King’s began its third drive on the ensuing kickoff only to see the Wilkes defense come up with its second straight big play. After a King’s catch at midfield, Ondre Roberts stripped the ball free and Jared Powell scooped up the ball and took it 48 yards for the second Wilkes score as the Colonels led 17-0 with 8:36 left in the first quarter. King’s used several plays to move into Wilkes territory on the ensuing drive only to fumble a second straight time to give the ball back to the Colonels. Jason Ugwu forced the ball out which was recovered by Robinson at the King’s 30 to hold the hosts scoreless as the first quarter ended. King’s used a 14-play, 92-yard drive including two fourth down conversions, one on a fake punt, to score its first touchdown of the game cutting the Wilkes lead to 17-7 with 5:31 left in the half. Following a Wilkes punt, King’s started a drive at its own 27. After a nine yard rush, Paskas picked off the Monarch quarterback for the fourth turnover of the first half returning the ball down to the King’s 24. Two Latierno rushes moved the ball inside the ten setting up a third and goal from the three yard line. From there a holding penalty on the Colonels stalled the drive and Wilkes elected to try a 36-yard field goal. Von Glahn’s kick was short as Wilkes went into the break with a 17-7 lead. King’s opened the third quarter with the ball driving 40 yards on nine plays before settling for a 33-yard field to come to within seven points at 17-10 with 11:16 left in the stanza. On the Colonels first possession of the second half, Wilkes quarterback Ryan Dailey hit tight end Garret Armstrong for a 24-yard reception moving the ball into King’s territory. After a barrage of penalties including two personal fouls on King’s, Wilkes moved to the Monarch 21. Dailey then took the ball on a designed run all 21 yards into the end zone to extend the Colonel lead to 24-10 with 8:05 left in the third quarter. On the next possession, a quick 63-yard scoring strike on a slant play brought King’s right back within one score trailing 24-17 with 7:03 on the third quarter clock. Wilkes went 13 plays and 51 yards on its next drive to move inside the Monarch 20, but Dailey was sacked on fourth and two to give the ball back to King’s as the third quarter ended. The teams traded turnovers on each respective drive starting with an interception by Powell returning the ball deep into King’s territory on the play. On first down, Dailey mishandled the ball off the snap and the ball was recovered by a Monarch defensive player to give the ball right back to the hosts at their own 30 yard line. The Wilkes defense stiffen on the ensuing King’s drive forcing a punt and Wilkes went to its big back Jacob Brook to seal the game on the ground gaining three first downs to run out the fourth quarter clock. Dailey finished 17-of-26 for 135 yards and one rushing touchdown to lead the Colonels under center. Latierno rushed 15 times for 70 yards to top the Colonels on the ground. The Wilkes defense was the difference in the game forcing five turnovers in the win, scoring once on the King’s miscues. Stengel concluded his junior season with 10 tackles and 1.5 sacks. Powell, who was named Wilkes Team MVP for the game, finished with four tackles, one interception and the 48-yard fumble recovery for the touchdown.